Read in all the aswers and take the average one – can’t be wrong… unless everybody is doing the same thing. 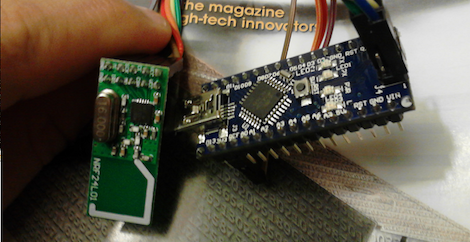 Step 1: Make clicker devices that work like the oem device. Step 2: Sale for $40 to your class mates. It’s a place of learning so of coarse the give you a easy experience of learning how to hack their hardware. maybe the edubuzzer project of viennas metalab might be interesting in this context. Does some one know if there is a open source “clicker” software server/clinet solution? Like PHP website or eaven custom server/client application. The write-up states some of the nefarious uses, but this work is also useful for students who require these devices for participation. I wish I’d seen this a few months ago – I had to pay about $50 for one of these pieces of garbage. Using this software you could purchase the $2 part off eBay and wire up your own. Many technically-minded students already have an arduino, so that would really be the only added cost. Well… I mean, he also used an Arduino… so about $32. Plus however much work it took; he had to sit in a few classes and just packet sniff, and analyze. Not every school uses the same system, you know? Anyway, as just a standalone replacement, it’s not really practical, I mean even he bought one it looks like (to find out which RF chip he needed). He just hacked the protocol for fun. True, but for me (a CS/CE student) I already HAVE an Arduino. I wouldn’t be purchasing one just for this project – so the cost is much lower. My school happens to have standardized on this system. I’m actually considering this just to screw with the professor for the last few weeks of the semester at this point. I love it, very clever. The sad thing is my mind immediately started thinking of effective software strategies for cheating with this. A) Take the simple average of the class, and choose that. Yes, most people could be wrong for a question but if they are there’s probably no shame in doing the same. B) Since your’e observing the entire class’s choices, you can build up a picture of how well each person does compared to the group average. Then get Bayesian with it. Start by assuming that everyone in the class is equally likely to get the answer correct. And that the class as a whole is, say, 60% likely to vote for the correct answer. Then after each question you can update your values for the class as a whole, and also each individual student. Eventually you could get to a point where your software has identified the two or three best students in the class, and could conceivably vote against the class majority if they agree on the answer. Just a minor correction to this (and every other response talking of ‘taking the average’). I think what you actually meant is to take the mode – the value that shows up the most. The average would be a fairly meaningless statistic here – you might have 75 responses of 1(also A) and 25 responses of 4(also D). The mean would be 1.75 (round to 2). The mode would be 1. Reminds me of my classes that used this. They were IR however and the receivers were easily overwhelmed by everyone voting so you had to keep trying or you’d be counted absent. I’d have liked to make a jammer. Then the profs would have to actually count people and know who they were. Hmm I attended more than one class that was 200+ people. We didn’t have clickers. I don’t really understand what the need for the clicker is. Oh man, where was this 10 years ago? I had a few classes with clickers and I hated them with a passion. I would have loved to troll the prof with this. How and where can I buy one? As a teacher I can tell you the process of using clickers has been HORRENDOUS and a disaster for my grading system because the data is (half way through semester) so far irretrievable and TP has NOT trained me well and if someone would hack in and make it impossible for me to use the damned things I would be very happy to trash them today. Plus I know y’all send your friends to class with your clickers.